Every year, Food Bloggers from all over the world get together for a fundraising campaign. We call it 'Menu for Hope'. Last year, we raised $17,000 to help UNICEF. This year, Menu for Hope III raises funds to support the UN World Food Programme, which provides hunger relief for needy people worldwide. Food is a joy to us Food Bloggers. On our blogs, we celebrate food as a delight or even an indulgence. Unfortunately, for many others who share our world do not share that privilege. For them, food is a matter of survival. This "Menu for Hope" is our small way to help.On our Menu this year is a great list of of amazing food related prizes. We hope that they will entice you to give whatever you can, and with luck you may win a unique and wonderful food gift offered up by food bloggers from around the globe. The rules are simple. For every US$10 you donate, you may claim one virtual raffle ticket toward a prize of your choice. The more you give, the better your chances of winning. You can also buy tickets for different prizes. The campaign is scheduled to run from now until Friday 22nd, 6PM PST, and you can purchase raffle tickets from anywhere in the world. Any shipping charges for prizes are being generously paid for by the prize donors. Please head over to Chez Pim for a look at the dozens of truly amazing prizes being given away, plus instructions on how to buy Menu For Hope virtual raffle tickets. You can also visit regional host, Kalyn's Kitchen, to read about other prizes donated from the Central U.S. So what did I donate? 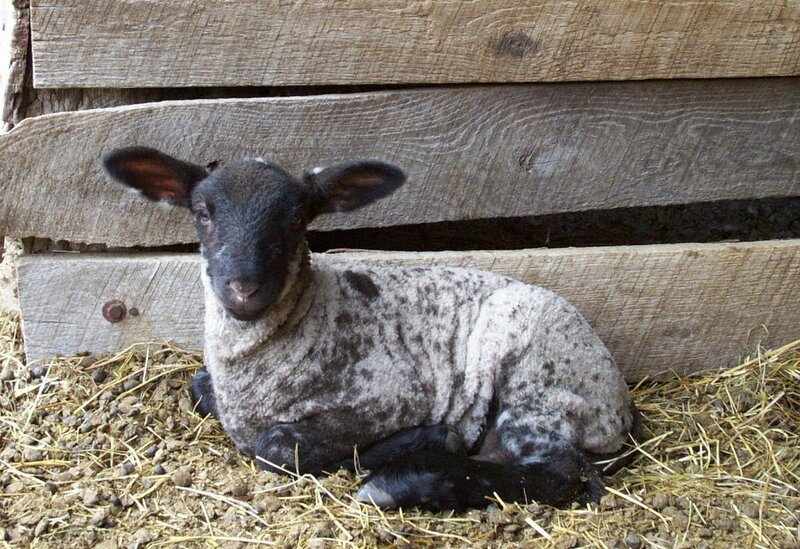 Well, Menu For Hope organizer Pim requested that I offer a repeat of last year's prize, so you now have the chance to win the 'honorary ownership' of the first ewe lamb born on my farm in 2007! And what does that mean exactly? You become the honorary owner of the lamb. You get to name your lamb whatever you want. And, if you so desire, you will receive (via email) periodic news about your lamb, including what she's been up to lately, how her health is doing, and photos as she quickly grows from absolutely adorable bouncing baby to lovely young lady (assuming, of course, that she is willing to pose for them). The code for my prize is UC13. Ding! Ding! Ding! It's the Holiday Gift Idea Bell ringing! Why not do a little multi-gift-tasking and purchase some virtual raffle tickets for friends, neighbors, the person who walks your cat, or whomever? Just choose the prize you think they'd like the best and let them know that you've not only made a donation to a worthy cause in their name, but that they might even win a nifty gift as well (like a sheep). You can't beat that. And many thanks, as always, for your generosity toward this and the other worthy causes I have asked you to support. Note: The spotted darling in the photo above is not your lamb. Your lamb hasn't been born yet. Cute, though, huh? Just wait until there are three or four dozen of them racing around next spring. Can't wait? 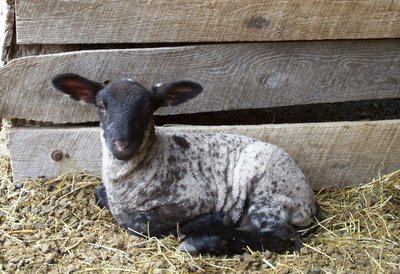 Click here if you'd like to meet Rose, the first ewe lamb born in 2006 who is "owned" by last year's Menu For Hope winner, Jennifer New (and who just may have a little lamb of her own come spring). 1. Go to the Menu For Hope III donation page at First Giving. 2. Make a donation, each $10 will give you one raffle ticket toward a prize of your choice. Please specify which prize or prizes you'd like in the 'Personal Message' section in the donation form when confirming your donation. Do tell us how many tickets per prize, and please use the prize code -for example, a donation of $50 can be 2 tickets for UW01 and 3 for UW02. The prize code for The Little Lamb To Call Your Own is UC13. 5. Check back at Chez Pim on January 15 when we announce the results of the raffle. I just wanted to let you know the Oatmeal Toasting Bread turned out to be such a hit that I received a few requests not only for more, but a couple of "how come I didn't get any?" comments with accompanying pouts. I can't wait to try out some of your other recipes. Thanks again not just for visiting but for sharing your farm with all of us. I can't find your 'item' over at Chiz Pim. Yay! I love hearing about bread success! (Not to mention accompanying pouts.) : ) Thanks for taking the time to let me know. Yeah, um, oops. I've just added a note at the bottom of this post. I was late getting it up (they've already raised nearly $12,000 in three days without me), so my prize and prize code aren't yet listed at Chez Pim and Kalyn's Kitchen--the regional Menu For Hope host. But they should be soon! My apologies for the confusion. Susan, your prize is UC13 and I'll be posting it soon!